It’s easy for a backyard picnic to get expensive. Fortunately, there are a few equally easy ways to control costs. We talked with eco-expert Pablo Päster about whether “eco-friendly” picnic items are worth the extra expense for the July/August issue of EatingWell Magazine and did some price comparisons of our own on which popular cookout foods will set you back the most. The results were often surprising. Here are 5 things you definitely don’t need to buy for your next cookout. 1. Skip: Fancy Picnic Sets – Reusable cups, plates and picnic baskets (or fancy sets of them all together) can be an environmentally friendly alternative to disposables…but only if you actually use them. Since they take a lot more energy to make than disposables, a durable item that collects dust in your closet after one use is actually less environmentally friendly than a disposable one. For instance, a stainless-steel travel mug has roughly the same impact as 24 paper or 46 Styrofoam cups. And then there’s the cost…the lowest price we could find for a picnic basket set with 4 plates was $39.99. That’s over nine times the cost of a 50-pack of plates. In other words, you’d have to go on at least 112 picnics with your reusable set for it to cost less. 2. Skip: Prepackaged Veggie Platters – What could be easier than grabbing an already assembled veggie platter from your supermarket’s deli counter and bringing it along to your next cookout? Sounds great, but that convenience comes with a price. You can save more than $10 by buying veggies from the produce aisle, cutting them and assembling your own platter. 3. Skip: Compostable Plastic Cutlery – So-called “compostable” plastics are being marketed as a greener alternative to traditional plastic forks and knives. The problem is, they might not be. According to Päster, there are conflicting claims about their true compostability. In addition, many recycling centers can’t process them. The result? These “green” plastics often end up in a landfill—making them unworthy of the steep markup they come with. A 100-pack of compostable plastic cutlery costs $10.10—that’s $6.31 more than traditional plastic, which, in many areas, can be recycled. 4. Skip: Disposable Bamboo Plates – Bamboo is often marketed as a “green” material. And in many ways it is: since it grows so fast, it’s much more sustainable than wood. However, most of the bamboo grown industrially comes from Southeast Asia. And since it’s both heavy and shipped a long distance that means it’s got a hefty carbon footprint. So much for sustainability! Until there are more domestic sources for this product, don’t be tempted. A 25-pack of 9-inch disposable bamboo plates costs a staggering $22.46. That’s $20 more than a pack of paper plates! 5. Skip: Prepared Fried Chicken – There are few things more classic than bringing fried chicken to your summer picnic. However, take care where it comes from. Premade 12-piece buckets can cost around $12.99/lb. at supermarket deli counters—and as much as $20 at national restaurant chains. 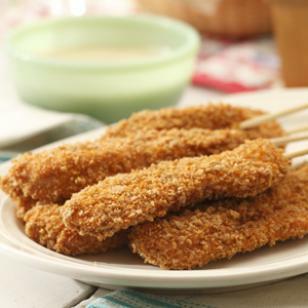 That might not seem like too much, but some of EatingWell’s oven-fried chicken recipes (including the Oven-Fried Chicken on a Stick, pictured above) shake out to a lean $2.07/lb. So making your own chicken will save you $10.92. Of course, there’s a nutrition bonus, too: fried chicken isn’t exactly the world’s leanest meal. A 5-ounce serving of chicken drumsticks from KFC has 334 calories and 6 grams of saturated fat. Our recipe has only 280 calories and 2 grams of fat. Talk about savings!